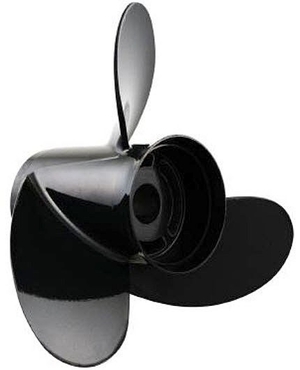 A boat propeller is a device, usually of metal, turned by a vessel's engine. The shape of its blades convert rotation into thrust, moving the boat forward. The propeller is attached to an engine's power transmission component, whether traditional shaft, saildrive, Z-drive, outboard or other. Their helicoid shape results in a pressure differential between the fore and aft sides of the blades as they rotate, creating the thrust to move the boat forward. They are made of bronze, aluminum, cupronickel or, less often, of plastic. Blade pitch indicates the propeller's angle of attack with respect to the water. This affects the speed/power relationship and must be adapted to engine characteristics. Variable pitch models can be adjusted to provide maximum efficiency and reduce fuel consumption. Folding propellers have blades which fold together when not in use. This reduces drag, providing better performance for vessels under sail. Choice will depend on boat type, engine make, model, power and transmission characteristics, including shaft diameter. For sailboats, cruising versus racing use also will affect selection.